A high school sub usually means your teacher's sick and you get a free period to screw around. But for one student, its meaning is a little more literal. Eighteen-year-old Justin Beckerman could be considered the reincarnation of Thomas Edison. 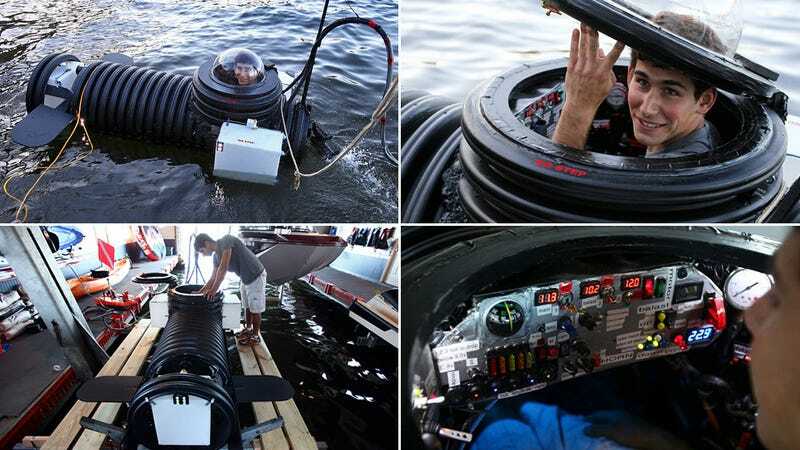 In his brief life, Justin's created a remote controlled cleaning machine, a helmet home theater, and now a fully functional one-man submarine that can dive as deep as thirty feet. It kind of puts your baking soda volcano to shame. Starting with a large nine-foot long drain pipe that was capped at both ends using copious amounts of marine-grade waterproof glue, Justin added ballast tanks to allow the sub to dive and rise, drive motors, a communications system including audio and video, and ultra-bright strobe lights that allow him to explore the depths of his local lake.